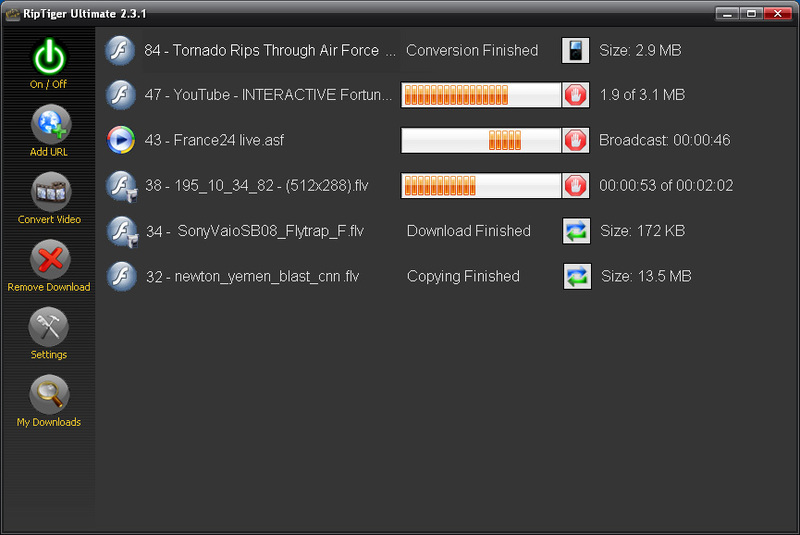 RipTiger Ultimate is the easiest way to capture, download, convert web video and online TV. Just start RipTiger, play your web video or web online TV as usual and RipTiger saves it automatically. Convert and transfer to iPod with a single push of a button. The other output formats supported by RipTiger are AVI and WMV. No additional click or configuration hassle. RipTiger Ultimate does everything automatically in the background for you. ...... watching. RipTiger captures web video automatically and downloads it while you continue surfing the web. All downloads are saved to your download folder so you can change file names, convert web video to other formats and enjoy your video. This state-of-the-art software records web video in the background in original quality, and you don't have to click or start each download process manually. Once you start watching the video on the web, RipTiger will pick it up and do the recording for you. RipTiger downloads compressed and high definition video from the web, saving its exact high quality copy to your hard drive. No quality loss in audio or video. Capture and Convert Web Video Automatically. RipTiger does everything automatically in the background for you. Qweas is providing links to RipTiger Ultimate 3.3.3 as a courtesy, and makes no representations regarding RipTiger Ultimate or any other applications or any information related thereto. Any questions, complaints or claims regarding this application RipTiger Ultimate 3.3.3 must be directed to the appropriate software vendor. You may click the publisher link of RipTiger Ultimate on the top of this page to get more details about the vendor.